Girl Reading The Post, a Norman Rockwell painting, appeared on the cover of The Saturday Evening Post published March 1, 1941. This is another favorite of Rockwell collectors, a classic enduring image of the world Rockwell painted. An alternate title for this painting is Cover Girl. This painting was Rockwell's 199th overall out of 322 total paintings that were published on the cover of the Saturday Evening Post. Rockwell's career with the Post spanned 47 years, from his first cover illustration, Boy With Baby Carriage in 1916 to his last, Portrait of John F. Kennedy, in 1963. This was also the first cover for The Post in 1941. In 1941, there were six Norman Rockwell Saturday Evening Post covers published. The original oil on canvas painting, 35.25 x 27.25 inches or 89.5 x 69 cm is part of the collection of the Norman Rockwell Museum of Stockbridge MA. It was a gift to the museum from the Walt Disney Family. The painting was originally given by Rockwell to Walt Disney and resided in the collection of the Walt Disney Archives for many years. The painting bears this inscription: "to Walt Disney, one of the really great artists, from an admirer, NR." This painting is part of the traveling exhibit, American Chronicles: The Art of Norman Rockwell. I had the pleasure of viewing it in Raleigh,NC at the Noroth Carolina Museum of Art. In this painting, Norman Rockwell uses a familiar device for humorous results. Rockwell often used objects to suggest a vision different from the reality of the scene. In this painting, he used the cover of the Saturday Evening Post to give this lady a different face than she would have had just a few minutes before. 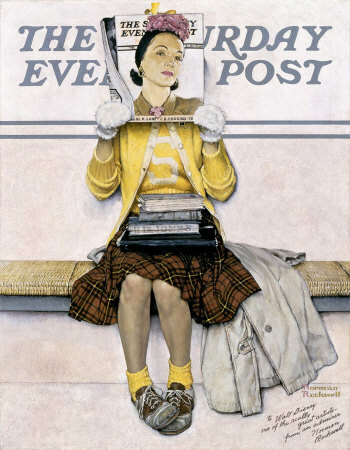 Another bit of amusement comes from the fact that this painting of a girl reading The Post appeared on the cover of The Post. Girl Reading The Post was only one of 322 Norman Rockwell Saturday Evening Post covers; Here is the list of Norman Rockwell Saturday Evening Post cover illustrations. Now, if Rockwell had only been prescient, he might have matched the cover story (printed along the bottom of the cover) on his Post cover with the cover story on the issue that this painting graced. I don't think even Norman Rockwell was that good! Do You Have A Great Story, Opinion Or Contribution About Girl Reading the Post?